Pioneers in the industry, we offer mild steel micron filter, micron filter, steel micron filter and ss micron filter from India. Standard housings are offered in SS 304, SS 316 and MS (either in epoxy painted or PP/rubber lined). In order to meet specification of pharma industry and to meet latest gmp requirement all our housings meant for sanitary, applications are provided with mirror finish on both, sides and are also electro polished to 240 grit finish wherever such a finish is called for. These filter housings are designed to accommodate types of filter elements having various end filter configurations viz DOE, SOE with code 7/2, or threaded connections. 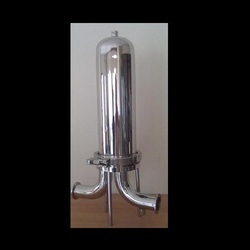 The filter housing supplied by us are used by the whole spectrum of process industry to cover pharmaceutical, synthetic fibre, petrochemicals etc. We are pleased to give below the salient features of the filters offered by us to suit your specific application. The Steel Micron Filter of 1.0, 0.45, & 0.2 are housed in a specially manufactured SS 316 housing. The code of the cartridges used is code 4-PP, PVDF, Pleated, Membrane cartridge. Specially Electro polished SS 316 housing with Derry Bends and SMS easily unlock fitting are used. Micron Filter Houses in Duplex SS , SS 316L and MSRL and also available for sea water applications. The micron cartridges used are PP, PVDF, Pleated Membrane, cartridges. They are far superior to any pleated, PP, cartridges. The ratings of the cartridges are absolute and guarantee to give the rating of filter prescribed. Canadian Clear filters carries a complete range of Micron Filters housing in variety of colours and designs. 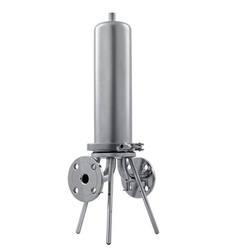 Micron Filters Housing are available in different modes of constructions, viz., Polypropylene, HDPE, SS 304 and SS 316. 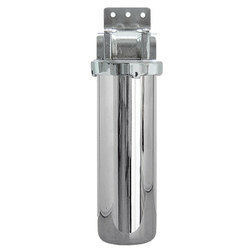 SS 304 / 316 Filter Housings are available with Threading or Dairy End Fittings or TC Fittings. 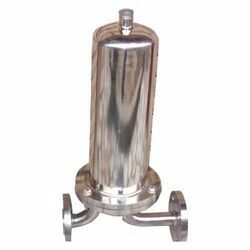 These Housings are available with Leg Supports.Filters are either used alone or installed in series to obtain better results and optimum life. Canadian clear also makes a complete line of filter cartridge having varied porosity from 100 microns to 0.2 microns in great variety viz. Polypropylene Wound and Spun, Melt Blown Spun, Resin bonded, Pleated and Activated Carbon Cartridges.